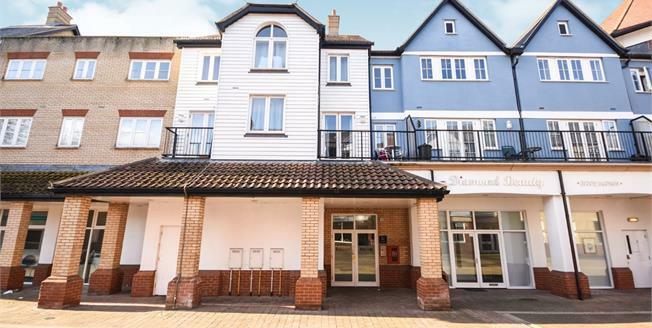 Abbotts are delighted to welcome to the market this fantastic purpose built apartment located within a stones throw of Rochford Town Square and a short walk of Rochford Station to make an ideal first time purchase not to be missed. This modern first floor property comes with a contemporary open plan living area including fitted kitchen and access to a private balcony overlooking the residents roof terrace, plus a double bedroom with built-in wardrobes and a fitted three piece bathroom. This excellent flat further benefits from secure entry via an intercom entry system, double glazing, a lift and is being offered for sale with no onward chain. Approximately 427 square feet. Communal front door with an intercom entry system, communal entrance lobby with lift and stairs to the first floor and landing leading to your own front door. Front door opening to the communal landing, intercom entry phone, airing cupboard, tiled flooring. Double glazed windows and French doors opening onto the balcony, plastered and coved ceiling, electric fire, open plan to the kitchen. (measurements are taken from the main living area, additional area to the entrance of the room). Private balcony with iron railing, communal roof terrace beyond. Fitted wall and base units and drawers, roll edge work surfaces, single sink and drainer with mixer tap, tiled splashbacks, electric oven, electric hob, overhead extractor, integrated fridge/freezer, cupboard with space for a washing machine, plastered ceiling, downlights, feature kickboards spot lighting, tiled flooring. Double glazed window, built-in wardrobe, coved ceiling, electric heater. Low level WC, panelled bath, shower over bath, pedestal sink, tiled splashbacks, tiled flooring, heated towel rail, extractor fan.